Though I like to call myself a Vagabondic, truth is I am an agoraphobic. For the past three years I have been unemployed, living with my parents in regional Australia, and confined to a small and shrinking world. Before this handicap hit me I did indeed glide around the globe, I glided around the world gleefully, domiciling in Japan for 10 years where I taught English and enjoyed all kinds of adventures, most of them legal and legit, heaps of them happy and some of them sad, all of them educational in one way or another. Every day in Japan was an adventure to be honest, an adventure and a cultural experience, as well as an initiation into the enigma of the East. If I had known, back then, that one day I would be compelled to crawl home to the sanctuary of Mum and Dad in smalltown Australia, that would have been like totally my worst nightmare... it would have been worse than a nightmare, in fact, because nightmares get awoken from eventually, while this affliction just keeps persisting on and on and on. It goes to show that fate, destiny, whatever you like to call it has a strange habit of reversing things, turning reality into dream, and dream into reality; now the Prodigal Son is home again, not because he wanted to return, but because he was forced to... and for a long time he was not particularly happy about that fact. He was pretty pissed off about it, to be blunt, and couldn't understand what had happened. 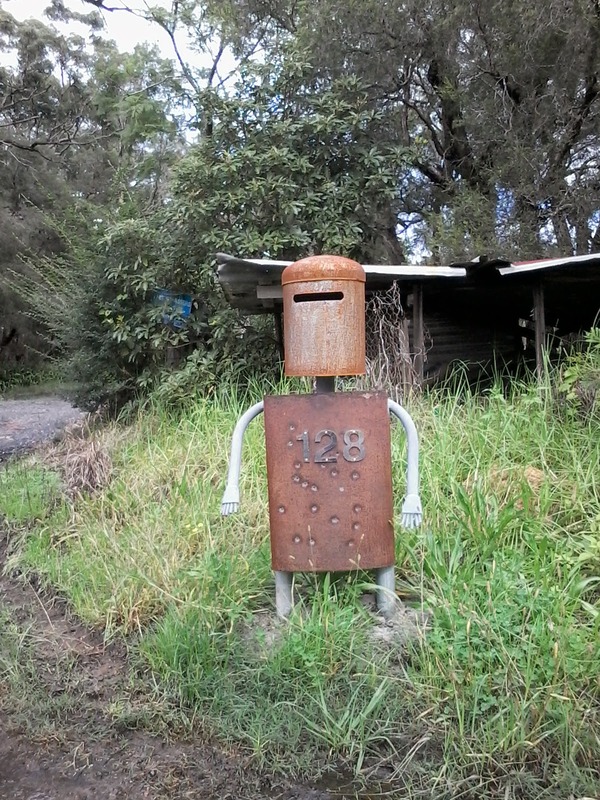 He had assumed, during those long halcyon days in Old Harmony, that his Australian life had been put far behind him. As it turns out, however, his Australian life is suddenly back in front of him, back in all its hoary glory, like a sumo wrestler in a cage fight, 400 pounds of grimace and pain. And, alas, the sumo is too big for Sonic to jump this time! Right now, I can travel only about 25 kilometers from home before I succumb to anxiety and stress. That's my Safety Zone, a circle with a radius of 25km. When I approach the edge of the Safety Zone my palms and scalp get sweaty, and my muscles seize up. The world closes in around me, and I worry that I am not really real. If I am driving a car, my zone is even smaller, I am not sure why. Maybe it is because driving is inherently more stressful??? hmmm, that sounds sensible enough. Crowds and loud noises frighten me, and coffee is a definite no-no. Although I used to travel frequently on the train, these days I can manage only one stop in either direction from my local station before I am forced to bundle out the door, hyperventilating. If I try to go two stops, I might well have a panic attack. For the past three years, this Safety Zone has been my prison. Now, it wouldn't be so bad if I was stuck in New York City, Paris or Prague. In such cities you could spend a whole lifetime within a 25km radius and never get bored. That's true too for Tokyo, and Seoul; hell, it is probably also the case with Tehran! These places have density, and history, and soul (and no doubt, plenty of agoraphobic artists there trying to make the most of their handicaps, trying to turn their afflictions into art!) The location of my exile, on the contrary, is a scrap of suburbia on the edge of scrappy bush, in what could possibly be the most boring barrio of the world: the Central Coast of New South Wales, north of Sydney on the eastern shore of Australia, the western edge of the Pacific Ocean. I am sorry if I have offended the locals by dissing your 'hood such, I know you guys love it a lot up here. I have to concede the weather is nice, if repetitively so. There are a lot of nice beaches in the area, which attract hordes of holidaymakers every summer. There are never any earthquakes (well, not that often anyway! ), nor are there any volcanic eruptions, nor political strife of any kind. That's partly the problem, though: nothing interesting happens! For me, a bit of danger always spices things up, like mustard on a dull cut of beef, or a hip-hop sample on an atmospheric Drum&Bass tune. This place is too vanilla, too white bread, too white trash for my tastes. If you are a fisherman, or a surfer, or a birdwatcher or tattoo artist, then the Central Coast is your paradise. If you are more interested in culture, and cuisine, and couture, then it is more likely to be your hell. That is my opinion, and I stand by it. But then I am biased, because I don't really want to be here in the first place. I have been in a lot of weird predicaments in my life, to be sure, but this predicament is the weirdest of them all: I am a traveler who is afraid of traveling, an agoraphobic traveler. Much as I pine to paddle across the Pacific, visit Vang Vieng, or shapeshift in the aforementioned Amazon, Fate has me dealt me another hand. In fact, She has placed me under virtual house arrest, for the foreseeable future at least! Lousy luck, you might say... lousy Lady Luck. Here at Vagabondic we like to delve deeper into the nature of things, however, and accept that every affliction has a spiritual meaning, a higher purpose if you like. Ian Thorpe's depression had a purpose, according to my edition of The Secret Language of Destiny: it manifested to manipulate him into diving deep into his repressed emotions. My Dad's Huntington's disease, meanwhile, might well be another kind of spiritual crisis, a lastditch intervention to coerce him into curtailing his need for control, before life pulls the plug and ends his present incarnation. Possibly my panic attacks and agoraphobia have a purpose too, possibly they are trying to tell me something. "But what on Earth could they be saying?" you might ask, and I have to agree, it is a tough question to answer. In order to find out, I believe we need to rise above our workaday ego concerns, and try to see things from a higher perspective. We need to see things from the perspective of our souls. I remember that my psychic mistress Janene used to say, during my apprenticeship, "If you can find happiness in a box, you can find it anywhere." Her premise was that even if you have just had your legs broken by a psychopath, your arms cut off, and the remainder of your body boxed in the basement, you could still be as blissed as a Buddha so long as you were plugged into the Source. Well, I am not quite at the Misery stage yet, but I definitely feel restricted, like a bird with clipped wings, or a dog on a lead, left to guard the yard all day long alone. But inside this restriction, perhaps, my future freedom resides, like the dots in a yin/yang taijitu, those phaseshifting telltales. Possibly, agoraphobia is commanding me to venerate quality over quantity, the local over the global, the trivial over the epochal, the micro over the macro. I have always been such a macrominded man, it is hard for me to be content just with the little things in life. I am going to have to learn to appreciate them, however, if I am to ever escape this mad torturer's dungeon. Furthermore, I suspect this ailment is challenging me into becoming more tenacious, more determined to achieve my dreams. Higher I is telling lower me: You are going to have fight for your dreams, fight for your right to orbit the planet... one hardearned mile at a time. And we are not talking frequent flyer miles here! This is the real deal, Marco Polo style. At the south-west edge of my Safety Zone lies the town of Wyong, population 3600, the seat of local government and the region's most important transportation hub. I have been catching the bus there a lot lately to see a psychologist about my agoraphobia, and challenge myself on the train. To pass the time waiting for my appointment or to celebrate a successful mission on the rails, I like to walk around and take photos of things that entice me. While I used to think that Wyong was a hole, I have been impressed lately by the number of old colonial buildings in the town. My Mum, who grew up here, knows the history of all these buildings, the families who used to live inside them, knowledge that I will attempt to preserve in the (evolving) photo essay above. Click on the link above to take a stroll through the streets of Wyong, a mile in my shoes, recorded for all time! 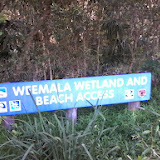 Walking in Weemala: Can I reach the beach? Right at the other end of my Safety Zone, on the Pacific Ocean, slumbers the small holiday hamlet of Budgewoi. Bustling Budgewoi it ain't... the town boasts all the buzz of a game of lawn bowls, or a mufti day at a nursing home. It does have some nice bushland, however, miles of long empty beaches, and it is the outdoors stuff that has been attracting me there lately. In June I drove over there and attempted to trek the path at Weemala Wetland all the way to the sea. Although it is a short path, just a few hundred metres, I was too anxious to complete it, and I had to scurry back to the safety of the car. Six weeks later I returned and this time managed to punch through all the way to the sand, where I was rewarded with views of bitou bush and Bird Island, bobbing out of the waves. This breakthrough perked me up, and emboldened me to probe further afield, further up the coast, where I am sure plenty of natural wonders await me. South of Budgewoi, well within my Safety Zone, Norah Head heaves itself out of the scrub and rocky coast, to become a prominent local landmark. 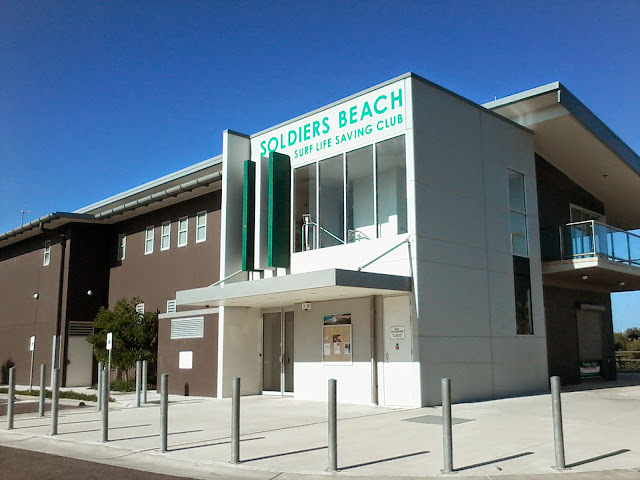 There is a lighthouse and a few beaches in the vicinity, the most famous being Soldiers Beach, one of the many places in Australia devoted to the legend of the Anzacs. Even in the middle of winter you can find decent numbers of people here, swimming and surfing, or exercising their dogs on the sand. Looking south, other headlands loom out of the salt spray, taunting me with their proximity. As a young man fresh out of college I worked as a cub reporter for the Wyong Shire Advocate, which had its office in Toukley, a quiet holiday town. During my second year at the Advocate my editor assigned me the round of covering the northern part of the Wyong Shire, specifically suburbs like San Remo which felt they were being neglected by the paper. One morning a week I would drive up past Budgewoi Lake and see what was going on. Frustratingly, I never managed to find many good stories. Nothing much seemed to happen in this part of the shire. Returning for a series of visits this winter, I found San Remo to be as sleepy as it ever was. 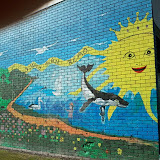 There are a lot of colourful murals, however, many of which bear Aboriginal themes, and depictions of local wildlife. They make suburbia that bit more cheerful. The town known as The Entrance is the most multicultural part of my realm, and potentially the most exciting. In summer when Lebanese women sunbathe on North Entrance Beach with their scarves and tattooed boyfriends, the place starts to resemble a baby Beirut. In the Thai restaurants on The Entrance Road, woks sizzle with the heat of Bangkok. White guys walk the streets with their Asian girlfriends. If I could hustle myself one of those, I might almost be content to live here. In early July I rode bus #29 from Lake Haven shopping center over to North Entrance (or do they call it The Entrance North? 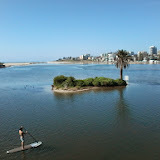 ), passing through Toukley and Norah Head on the way. My plan was to walk back the three-hour route through the depths of the Wyrrabalong National Park to Wallarah Bay Recreation Club east of Toukley, where my Dad and hopefully a few beers were waiting for me. When I dismounted from the bus near Wyuna Avenue, I was feeling a little shaky and slightly derealized/depersonalized, afraid of the blue sky and shining sun. I wasn't in the mood to hang around here on the edge of my Zone, so I commenced the walk home more or less immediately, by following Wilfred Barrett Drive which comprises a section of the busy Central Coast Highway. It wasn't so pleasant getting hammered by the passing traffic and tagged by burrs on the edge of the road, so I quickly ducked into a bicycle track which the council had constructed, leading into the national park. 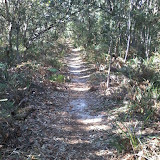 It was calmer and more comfortable in the bush, and I felt a lot safer, but the path presently looped back to the highway forcing me to share my journey once again with the speeding cars, trucks and buses. A few miles later I spotted what looked little more than an overgrown rut trailing back into the bush, and I decided to give it a go. The rut proved to be a more interesting alternative than either the highway or the cycleway, and it led me on a a wild voyage through the heart of the forest. I soon encountered a whole network of ruts, in fact, all of them named after the local flora: red gum, burrawangs and magenta lillypillies. The ground was sandy, and littered with seed pods. At one stage I mounted a small ridge, which granted me a stupendous view of the national park, and miles of red gums. No sign of civilization at all! If these photos sometimes seem clumsy and clandestine, that's because they were taken furtively, on the fly. I apologize for any fingers in corners of the frame, blurriness and so on. When you are taking photos on the boundaries of your range, you don't have time to compose the scene artfully. It is rather a case of shoot and run. 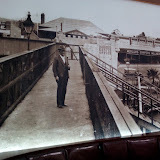 Nonetheless, I hope there is something Mirror Sydney about these suites, with all their attention to detail, the celebration of the minutiae, preservation of local history, and the elevation of the microcosm over the macrocosm. I hope that, as time goes by, I will get more adventurous, and push a little further against the bubble that encases me. One day I might even make it to Bateau Bay!